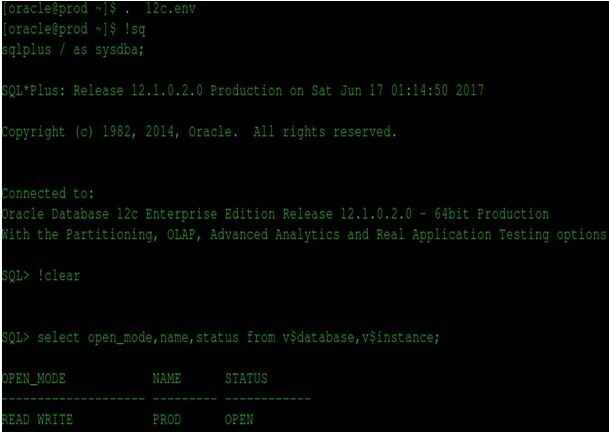 20:45:08 SQL> Rem Copyright (c) 2006, 2017, Oracle and/or its affiliates. 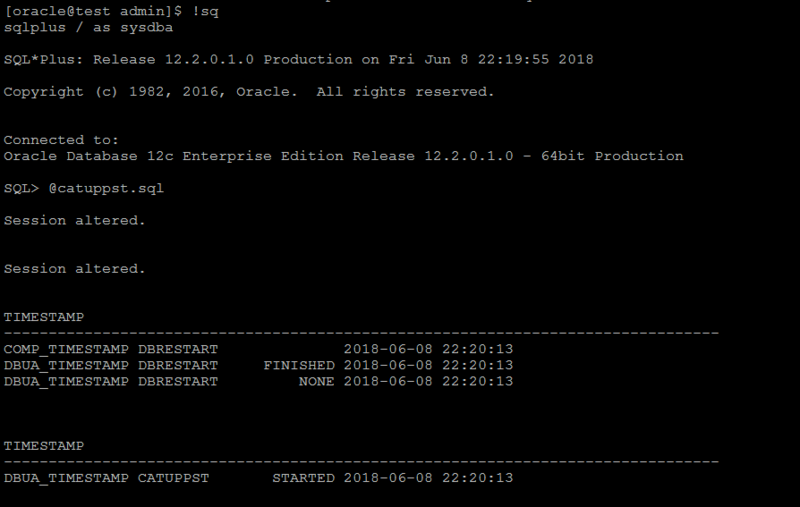 20:45:08 SQL> Rem All rights reserved. 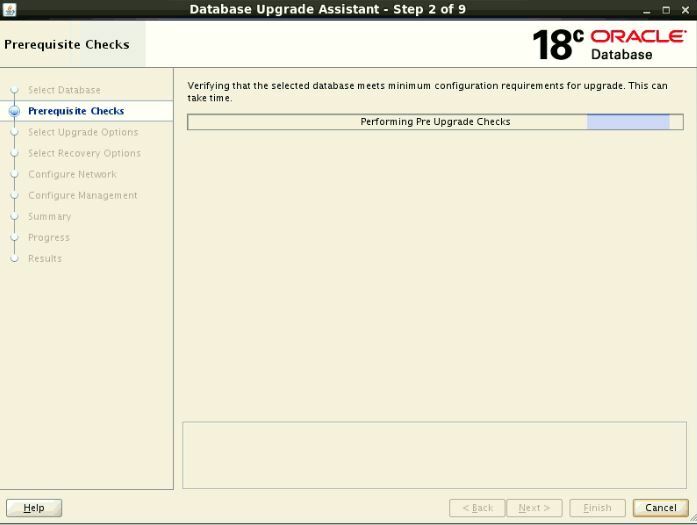 20:45:08 SQL> Rem do not require that the database be open in UPGRADE mode. 20:45:08 SQL> Rem Automatically apply the latest PSU. 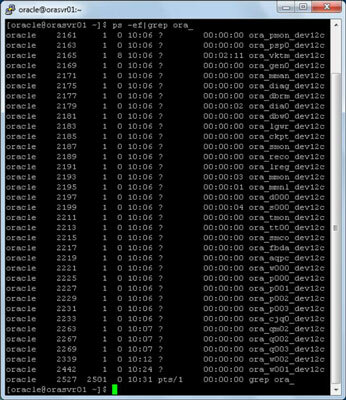 20:45:08 SQL> Rem You must be connected AS SYSDBA to run this script. SQL> Rem Copyright (c) 1998, 2017, Oracle and/or its affiliates. SQL> Rem This script recompiles invalid objects in the database. 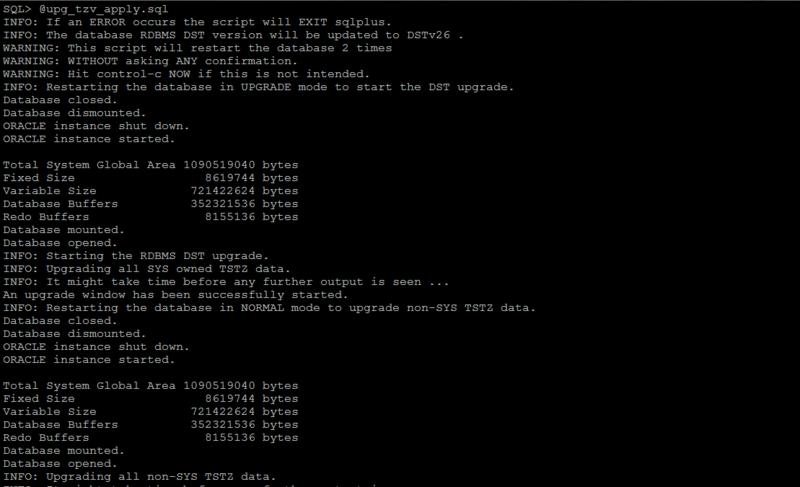 SQL> Rem script after upgrades, downgrades and patches. SQL> Rem * This script must be run using SQL*PLUS. SQL> Rem * You must be connected AS SYSDBA to run this script. SQL> Rem script. Not following this recommendation may lead to deadlocks. 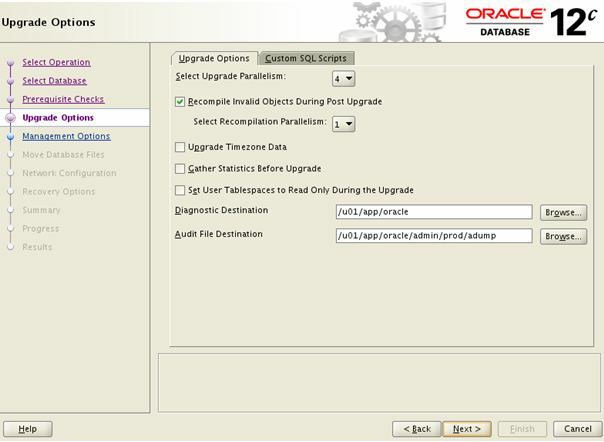 SQL> Rem jdavison 04/11/00 - Modify usage notes for 8.2 changes. SQL> Rem usundara 04/29/98 - creation (split from utlirp.sql). SQL> Rem author of this script. SQL> Rem Copyright (c) 2003, 2017, Oracle and/or its affiliates. 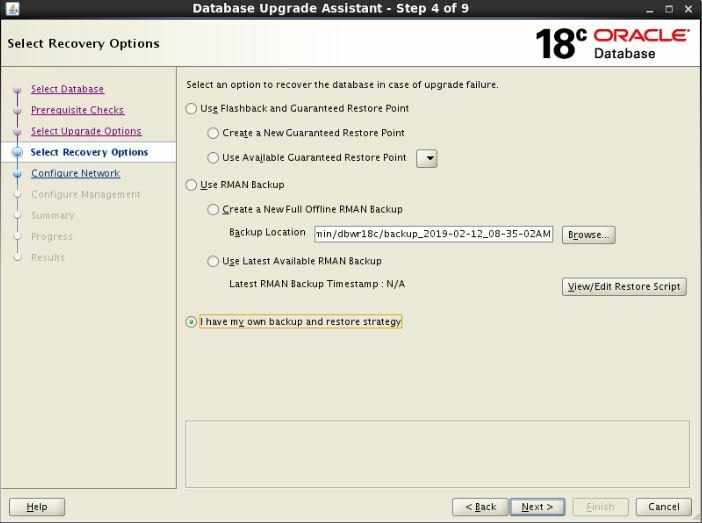 SQL> Rem remaining at the end of a database upgrade or downgrade. SQL> Rem latencies due to automatic recompilation. SQL> Rem This script is a wrapper based on the UTL_RECOMP package. SQL> Rem see the documentation for package UTL_RECOMP for more details. 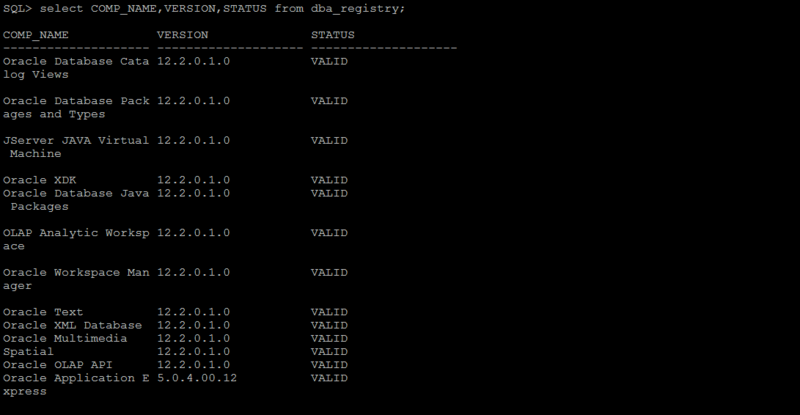 SQL> Rem UTL_RECOMP for more details. SQL> Rem can be used to recompile objects in Proxy PDB. SQL> Rem here, is no longer needed. SQL> Rem Copyright (c) 2014, 2015, Oracle and/or its affiliates. 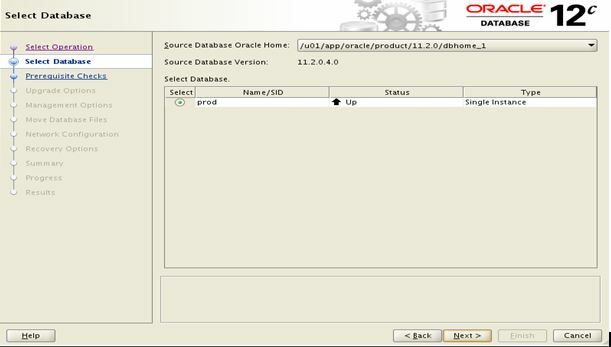 Shutdown and startup database in normal mode. 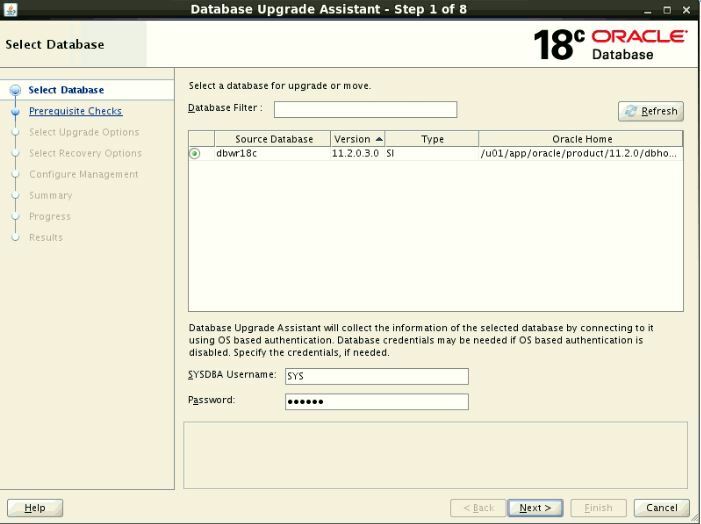 Upgrade the database zone file. 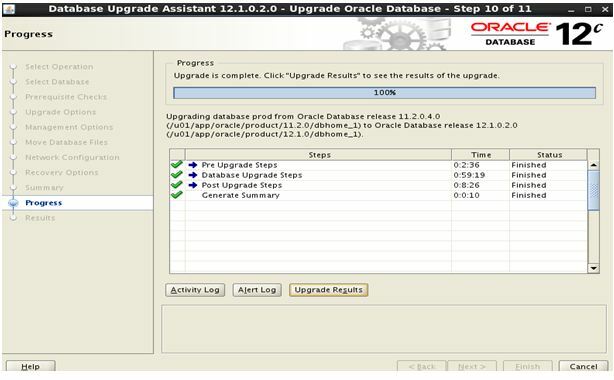 dba_tstz_tables view displays the tables that are processed by the time zone file upgrade, and their current upgrade status. 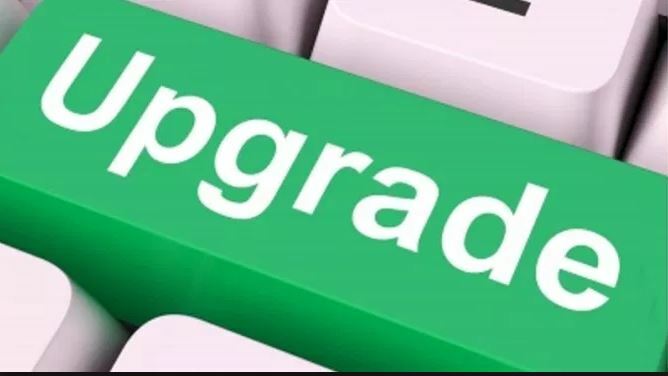 Once the upgrade is complete, check the time zone file version. 13. post_fixed_objects       NO        Informational only. 14. upg_by_std_upgrd         NO        Informational only. MMAN dynamically adjust the sizes of the SGA components like buffer cache, large pool, shared pool and java pool and serves as SGA memory broker. 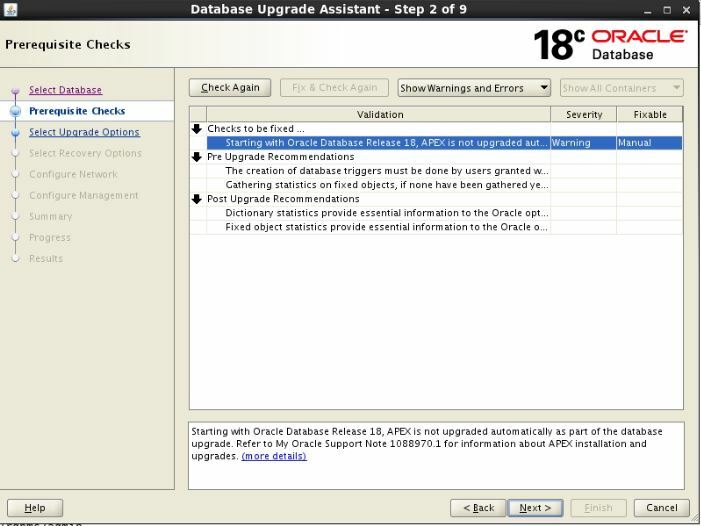 It is a new process added to Oracle 10g as part of automatic shared memory management. Automatic Shared Memory Management, or ASMM is what you do when setting SGA_TARGET and not setting MEMORY_TARGET. Basically, you define the size of the SGA you want to allocate at startup and that will be available for the instance, most of it being buffer cache and shared pool. 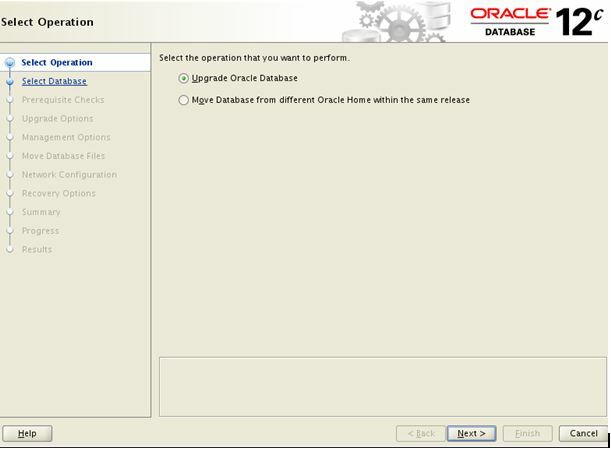 SGA_TARGET and SGA_MAX_SIZE because on the most common platforms, all is allocated at instance startup. Then, in addition to this shared area used by all instance processes, each processes can allocate private memory, and you control this with PGA_AGGREGATE_TARGET. The total size of SGA and PGA for all instances in a system must reside in physical memory for the simple reason that they are mostly used to avoid I/O (a large buffer cache avoids physical reads and optimizes physical writes, a large PGA avoids reads and writes to temp files). 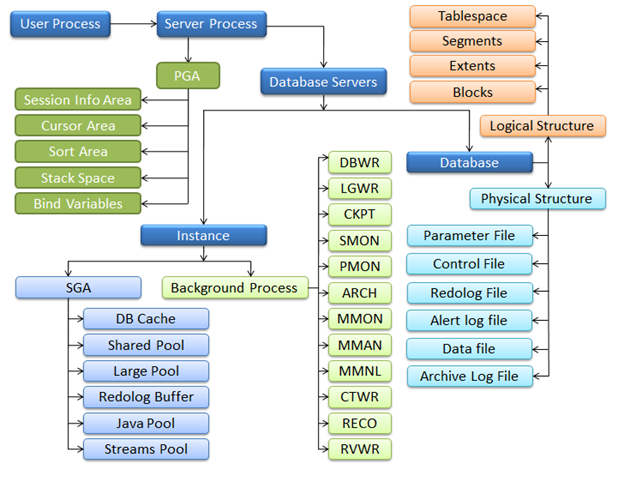 MMAN background process manages the dynamic resizing of SGA memory components depending on load for database. Responsible for managing instance memory based on the workloads. This is related to performance tuning and troubleshooting. check status of mmon process, if it found as not running. 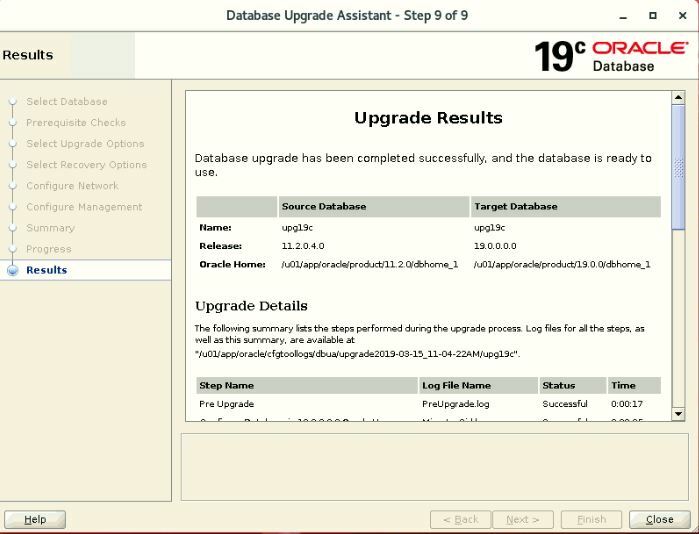 1)Using Goldengate we are going to upgrade from 11g to 12c database without any downtime. 2)Already Data is available source11g scheme Hari. 1)check network between source and target. 2018-07-31 19:56:12 INFO OGG-01788 SCHEMATRANDATA has been added on schema hari. 2018-07-31 19:56:12 INFO OGG-01976 SCHEMATRANDATA for scheduling columns has been added on schema hari. 2018-07-31 19:56:34 INFO OGG-01785 Schema level supplemental logging is enabled on schema HARI. 2018-07-31 19:56:34 INFO OGG-01980 Schema level supplemental logging is enabled on schema HARI for all scheduling columns. Manager is running (IP port gg-12.2.com.7810, Process ID 3999). Successfully created checkpoint table gguser.checkpoint. The authenticity of host ‘192.168.2.157 (192.168.2.157)’ can’t be established. RSA key fingerprint is c2:3d:72:16:52:01:ae:5c:41:6b:34:f5:c7:a1:df:74. Warning: Permanently added ‘192.168.2.157’ (RSA) to the list of known hosts. 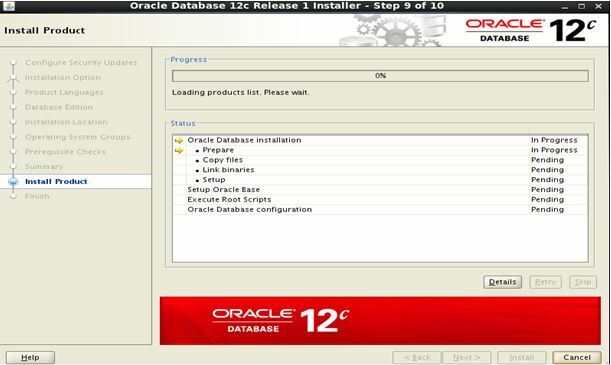 Repoint the users from 11g to 12c server. 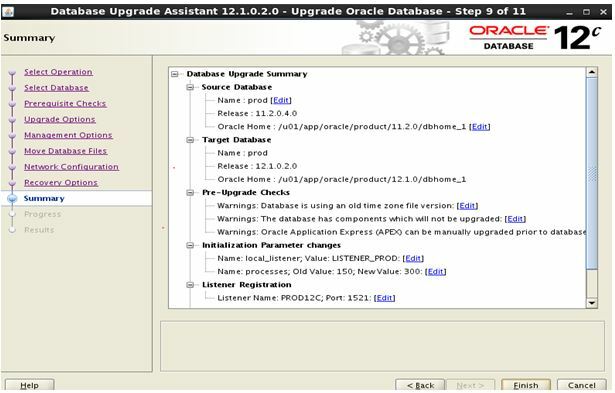 The preupgrade.jar Pre-Upgrade Information Tool is supplied with Oracle Database 12cR2. A. To remove EM console. B. Run the below block for refresh the materialized views. 3. 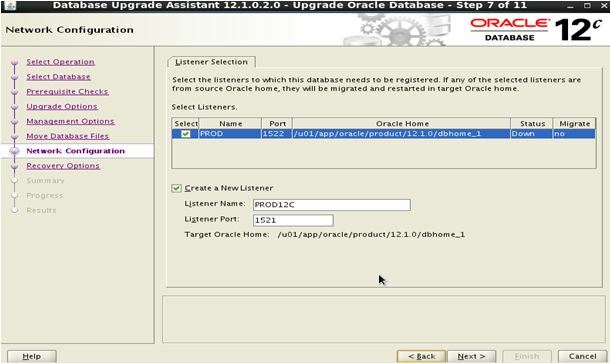 Copy the parameter and password file from the 11g home to the new 12c home. 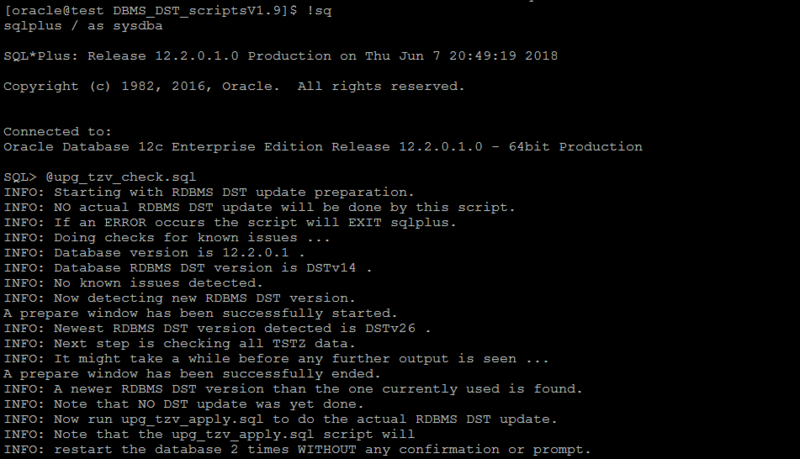 Download DBMS_DST_scriptsV1.9.zip file from metalink. 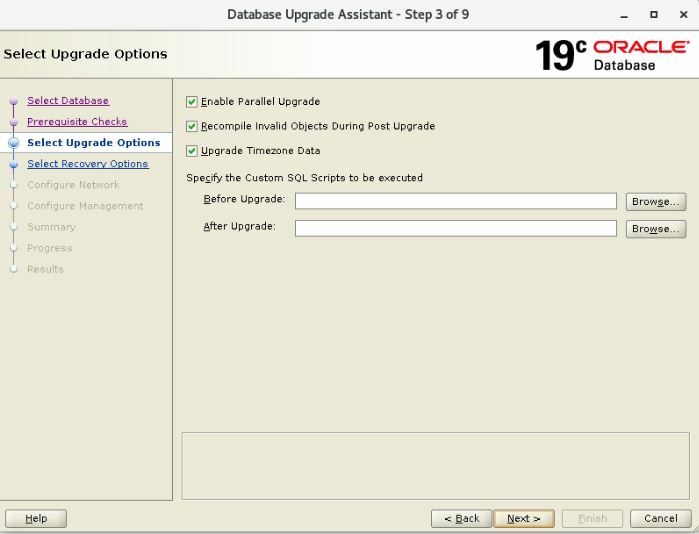 Unzip DBMS_DST_scriptsV1.9.zip file we will get below sql files for upgrade the timezone. Now it’s changed from 14 to 26. 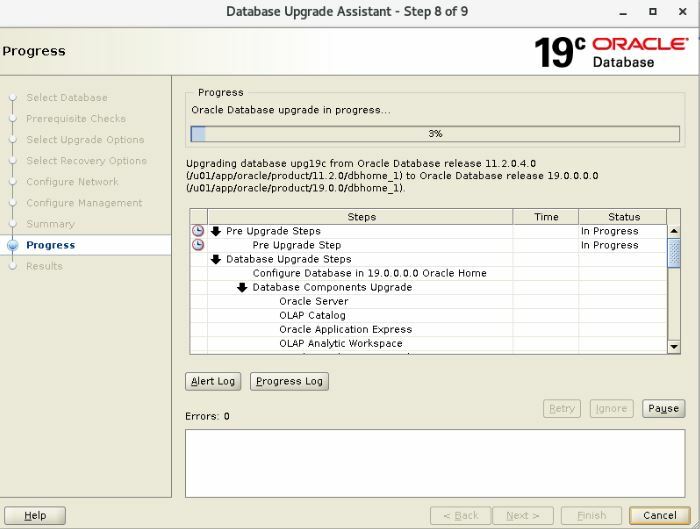 This tool is supplied with Oracle Database and displays the version and elapsed upgrade time for each component in DBA_REGISTRY. 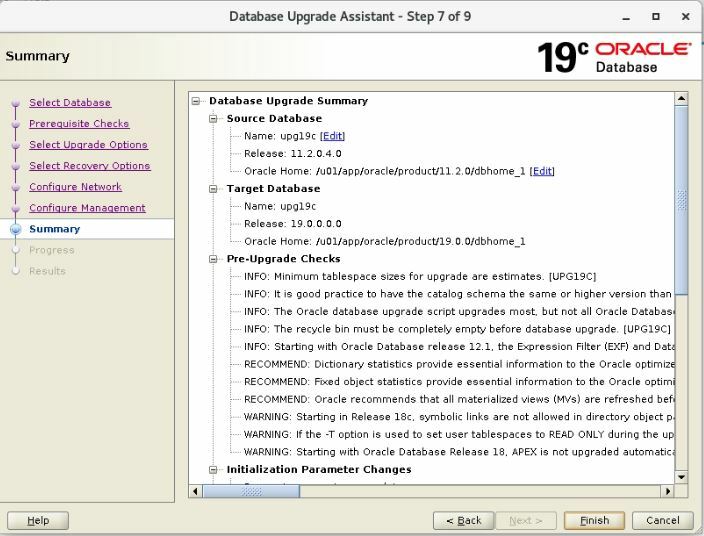 If an Oracle bundle patch or patch set update (PSU or BP) is installed in the Oracle home, this script will automatically applies those patch set update to the database. 9. 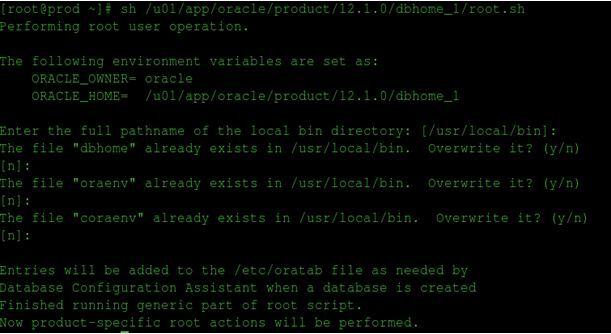 Execute utlrp.sql script to compile invalid objects. 10. 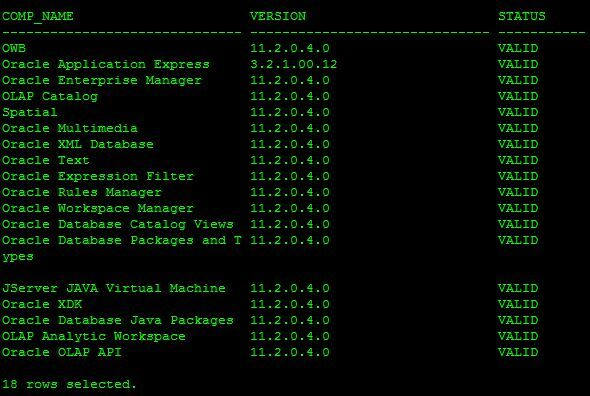 Set COMPATIBALE parameter value for 12.2.0 as well as start the listener with 12.2 home. 11. 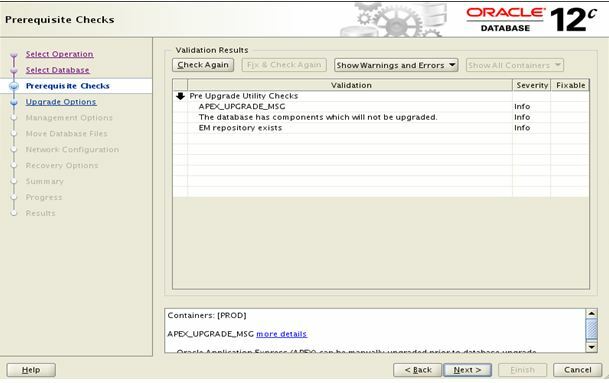 Finally to check the component and version using dba_registry view. 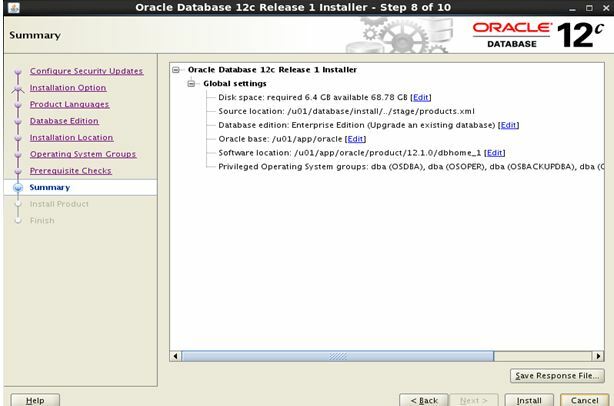 Step 1:- Check the registry for the 11g database. 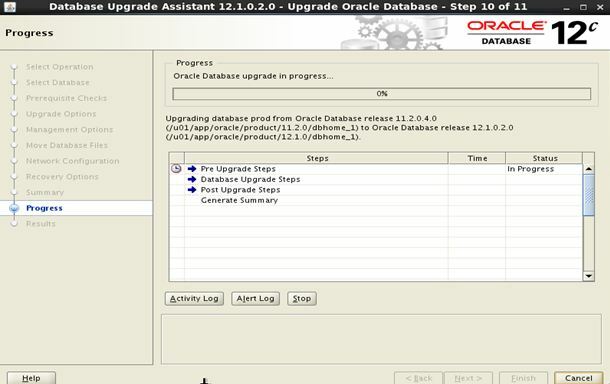 Step 2:- Check the invalid for the database before upgrading to 12c. 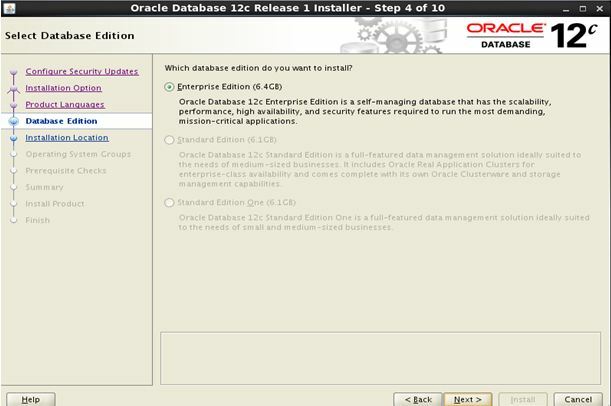 Step 7:- Select the Enterprise edition of the oracle software 12c. 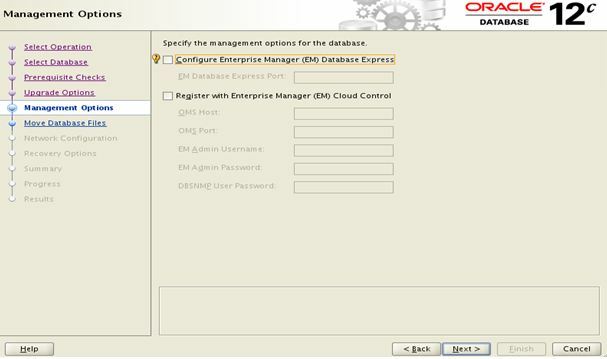 Step 9:- Select the privileged owner of the users and group. 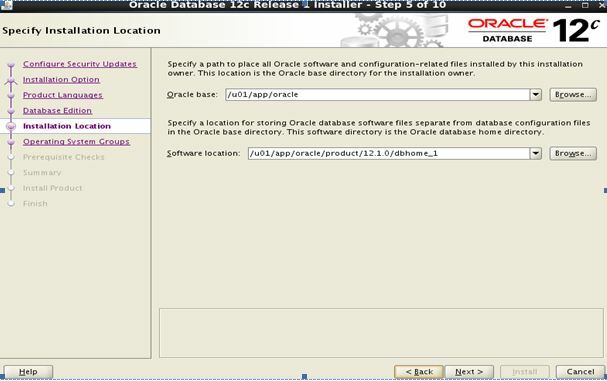 Step 10:- Select Install option to install oracle binaries. 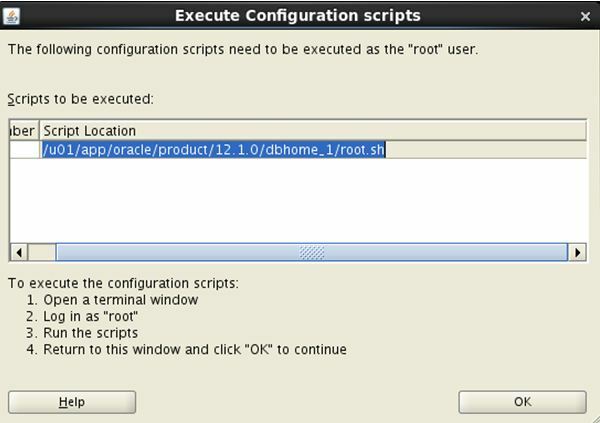 Step 11:- After installation of Oracle binaries,execute the script root.sh under ORACLE_HOME location. 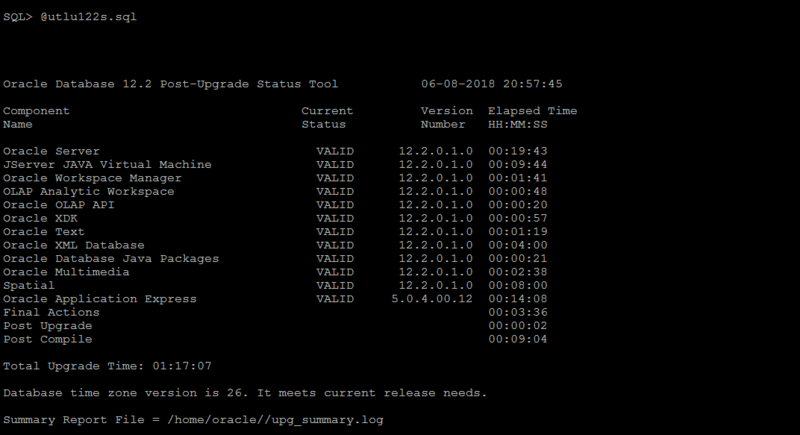 Run the Pre-Upgrade Information Tool script preupgrd.sql and utluppkg.sql from the Oracle Database 12c Release 1 (12.1) . 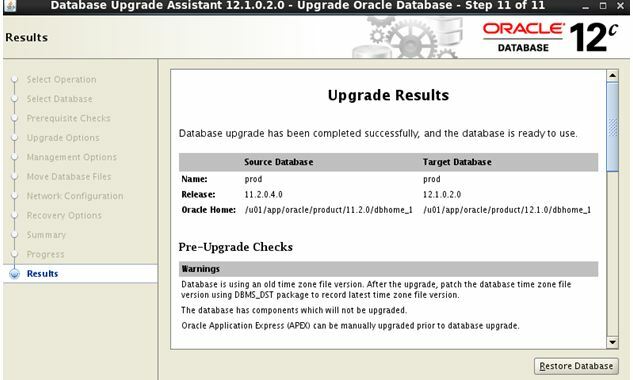 If any warnings and errors, you can execute preupgrade_fixups.sql to get fixed. 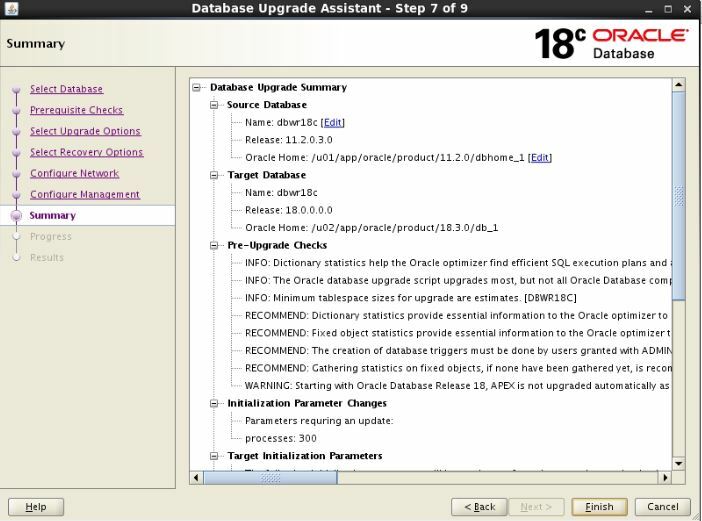 postupgrade_fixups.sql script that should be run after the upgrade. 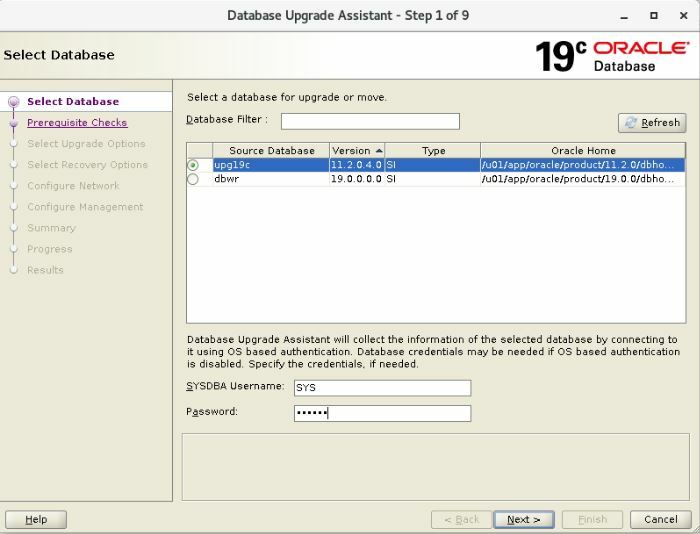 During the upgrade to Oracle Database 12c any passwords in database links are encrypted. To downgrade to the original release, all of the database links with encrypted passwords must be dropped prior to the downgrade. 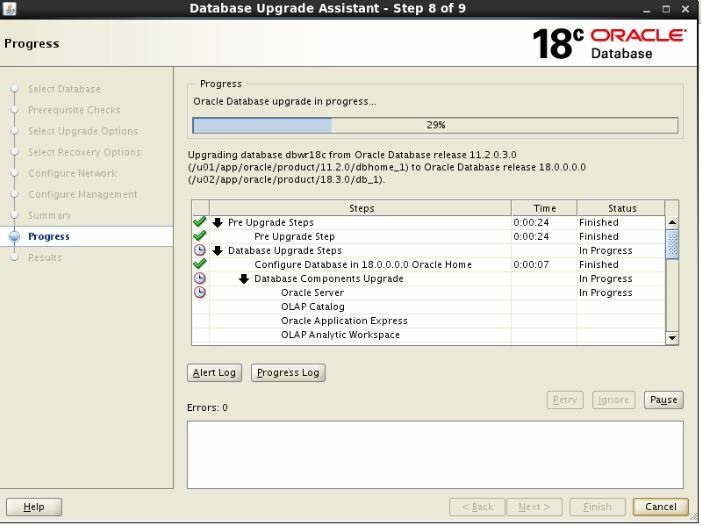 Step 17:- In this screen, select the Upgrade Oracle Database option, then click the “Next” button. 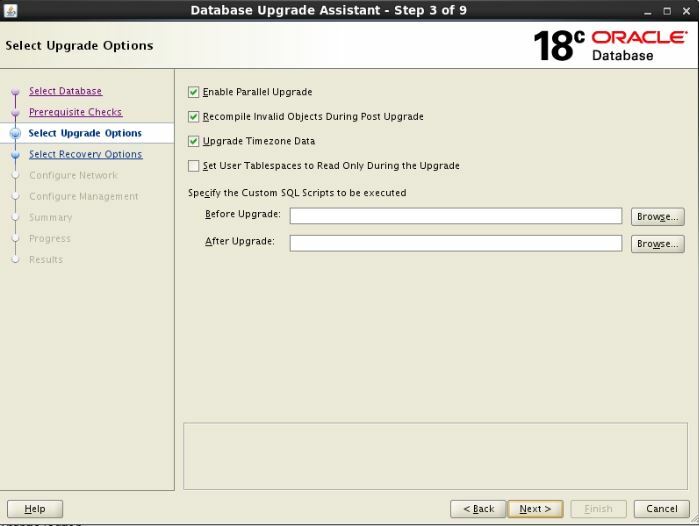 Step 18:- Select the database you wish to upgrade and click the “Next” button. 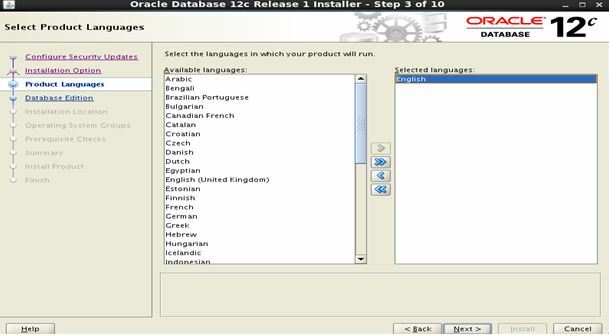 If you do not see your database listed here, please add an entry in “/etc/oratab” as shown above. 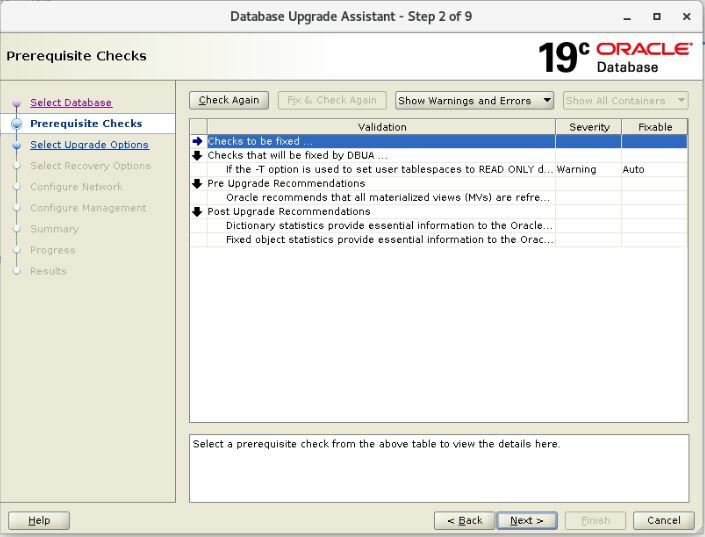 Step 19:- If the prerequisite checks highlight any issues, take the appropriate action to fix the issues. If all the prerequisite checks are passed, click the “Next” button. 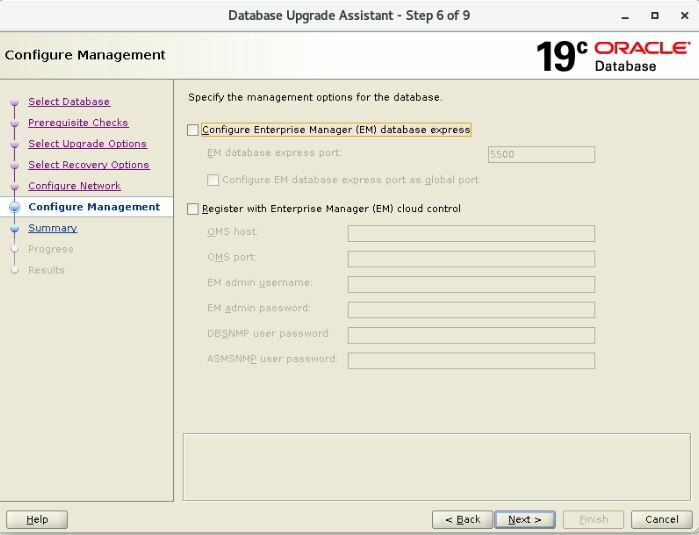 Step 20:- Amend the upgrade options if necessary, then click the “Next” button. 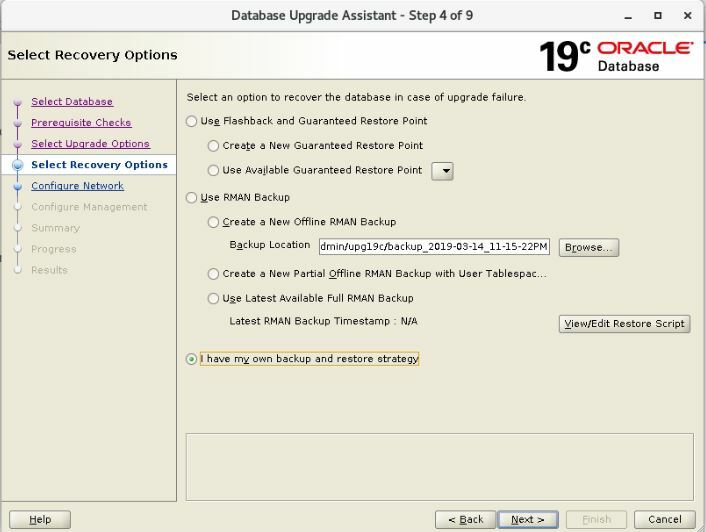 Step 22:- If you need to move the database files and/or the fast recovery area from file system to ASM or vice versa, check the relevant option and enter the destination. Click the “Next” button. 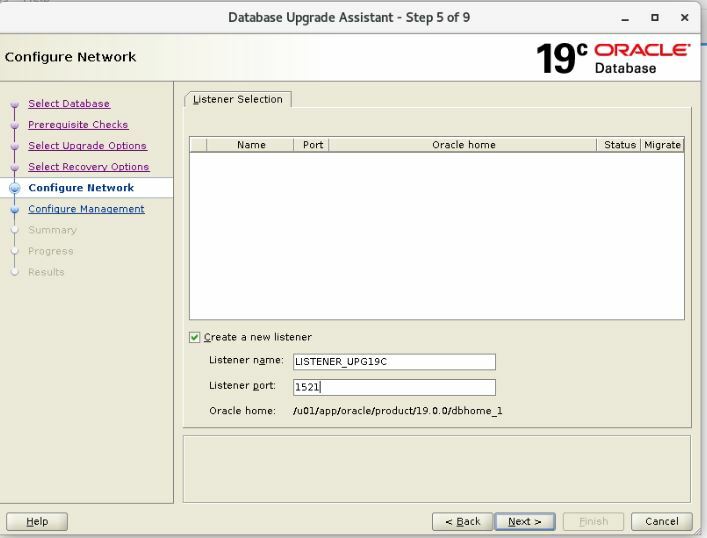 Step 23:- If this database is the only one using the 11g listener, accept the defaults, so the listener will be upgraded. If you prefer to manually define a new listener, you can do that now too and click the “Next” button. 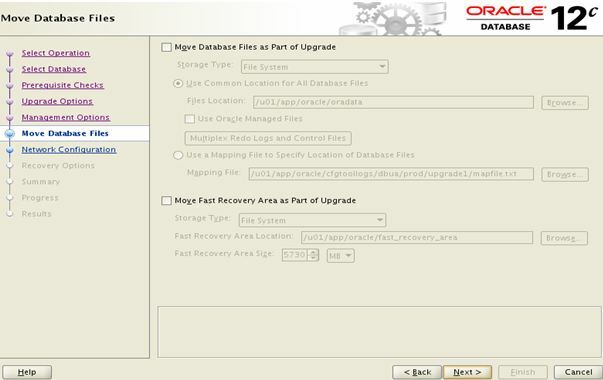 Step 24:- Select the recovery options for use in the event of an upgrade failure, then click the “Next” button. 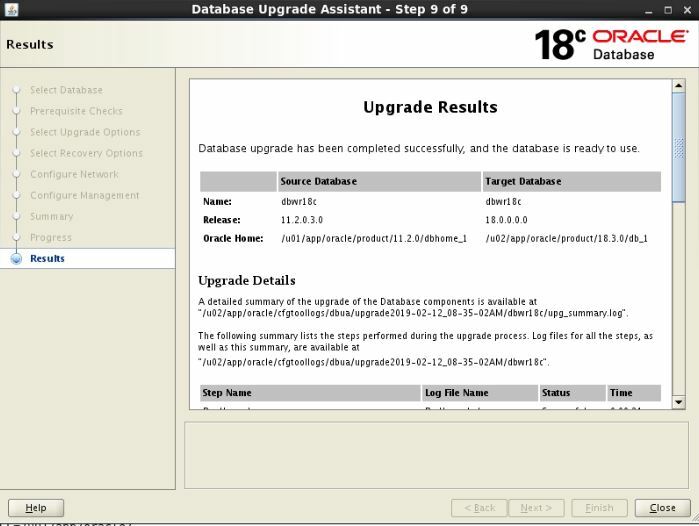 Step 25:- When the upgrade is complete, click the “Upgrade Results” button. 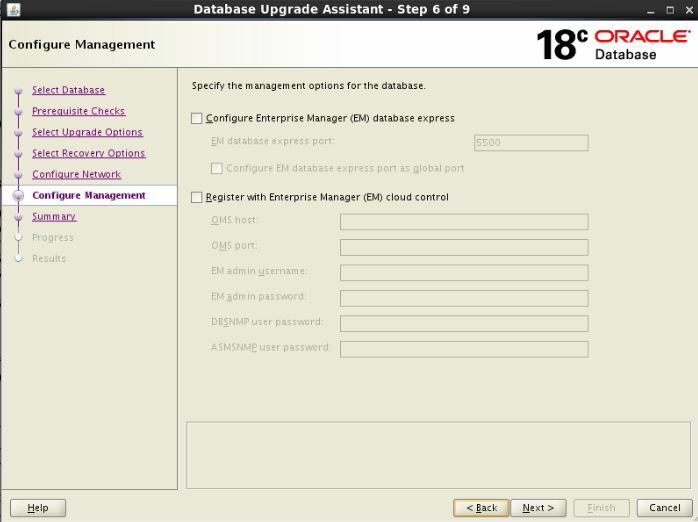 Step 26:- Check the upgrade results, then click the “Close” button to leave the DBUA. 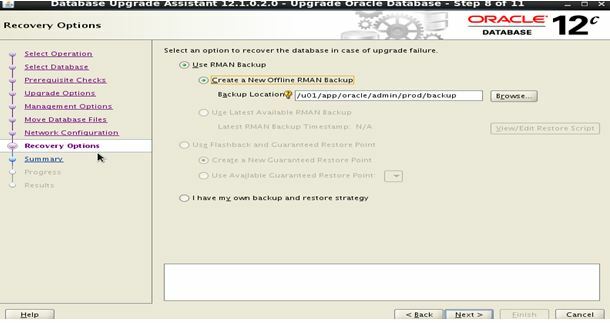 Here you can optionally restore the database to old version by clicking on “Restore Database”. 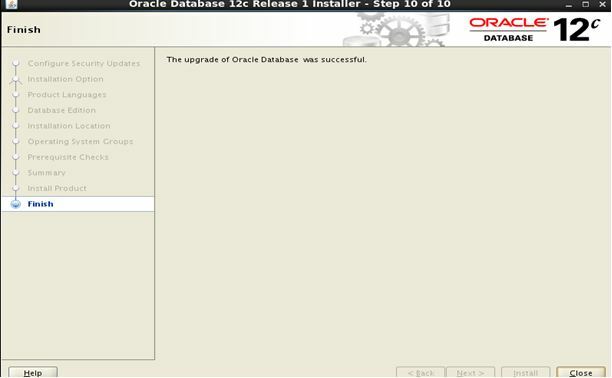 Step 27:- Now the database upgrade is complete and the database is ready for normal use.